Hi, I create one of a kind photo jewelry using the client's photograph and message. 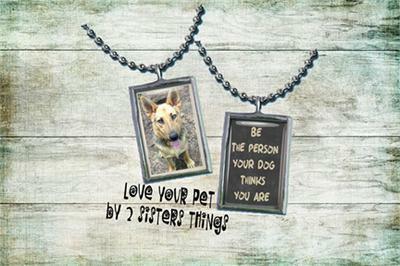 These pieces are perfect for all pet lovers and owners, what a wonderful way to keep your pet close all day. When we love something, we keep it close to our hearts. Let us create a beautiful one-of-a-kind pendant that will let you hold tightly to the things you cherish. Our double-sided art pendant/charm will feature a high resolution image encased in glass. Each pendant/charm is carefully soldered by hand using timeless stained-glass techniques. We believe jewelry isn’t just supposed to be pretty. We believe it should say something about the wearer. Our handcrafted charms and pendants will add a unique and special touch to any jewelry collection. 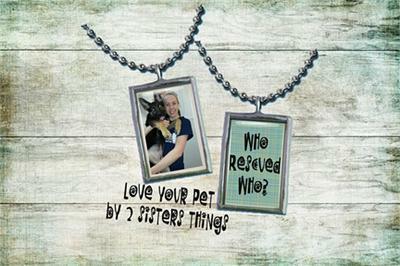 You may soon find that your 2SistersThings pendant is your most cherished piece. Because each piece of made by a skilled hand, no two are alike. Each piece has its own personality, which is most definitely unique. I have been creating these little treasures since 2008 and love every minute of it. I love seeing each beautiful photograph and knowing they will be treasured forever makes my heart smile. I hope you will enjoy wearing them as much as I enjoy creating them.